PopPopMan.co.uk - buy one get one free! I'm sure we are all familiar with modern sales techniques and I've pinched this snappy and alluring title to look at 3 sets of boats in my collection. The first two we will look at were sold as a set, the third ones were made to go together, but were sold separately. I say sets, as each steam powered pop pop boat has a companion vessel, which is towed behind, having no power source of its own. Our first pair hail from Asia. The pictures above show a Japanese made "pop pon" boat, No "D". This is powered by a conventional diaphragm pop pop engine and is approx. 4.25" (11cm) long. 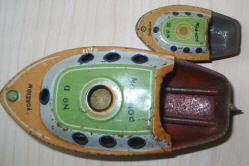 Its tender "pon pon" No "E" is a mere 2" (5cm) long and is a miniature, but unpowered version of its big sister. The only other variation is the absence of a rudder. These models are marked "foreign" which indicates they were made in Japan, in the immediate post war period, mainly for the American market. Thus easing international attitudes in that sensitive period of history. The Americans had a similar negative attitude towards the Japanese as the British did towards German goods. On now to America. The photograph above shows another set of boats made in the post war period. These however were made in the USA and unlike the previous pair, which were printed tinplate, these are plain aluminium. 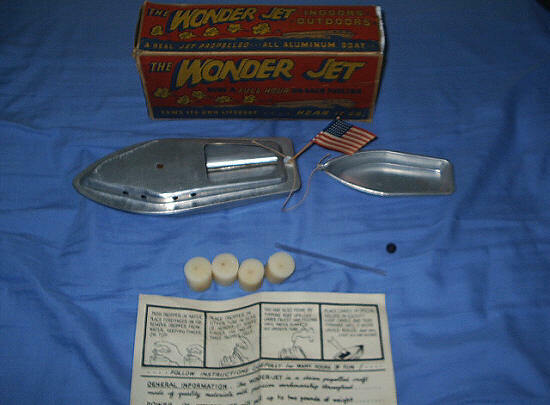 Manufactured by the Hoffmam Manufacturing Co. of Carlisle, Pennsylvania, they were marketed as "The Wonder Jet". The blurb on the box proudly boasts that it runs for a full hour on each fueling. It also tows its own lifeboat, which measures approx. 5" (12.5cm) long. 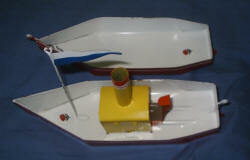 The powered boat is approx 8" (20cm). It was supplied with a tow rope, an American flag and some hefty looking candles (for fuel). Our last port of call is Africa (see above pictures). 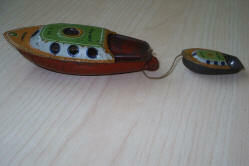 The leading boat is called the "Taurus" and measures approx 9.75" (25cm), its companion is described simply as a "Barge". Made in the small town of Napier in South Africa, they were lovingly manufacturered by a gentleman called Alan Raubenheimer and his staff at Rose Boats. Their quaint handcoloured leaflet describes their boats as follows. "Rose Boats tinplate (tin coated steel) steam boats are delightful toys, beautifully hand made in the old tradition, plastic free and fully guaranteed.They are driven by the powerful all copper and brass cyclic flush steam (pop pop) engine and will sail unattended for up to an hour on a single filling of boiler and candle burner. Engines make a realistic sound and funnels puff real smoke. Since their introduction in 1986 they have gained a reputation for reliability and superb workmanship." 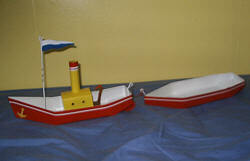 I have a number of Rose boats in my collection and I can testify to their quality of workmanship. They really run well and it's true about the real smoke! So three very different boats from three very different parts of the world that illustrate that even power in miniature can be harnessed to good effect. You never know, the next time you buy one you might get one free!